William Barr. Photo courtesy of Kirkland & Ellis. Attorney General nominee William Barr said in written testimony released on Monday that he won’t allow partisan politics or other considerations to interfere with the work of special counsel Robert Mueller, a friend as well as a professional acquaintance. 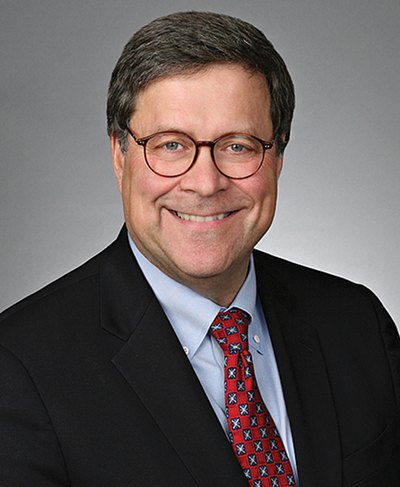 “On my watch,” Barr said, “Bob will be allowed to complete his work.” Barr is scheduled to testify before the Senate Judiciary Committee for his confirmation hearing on Tuesday. The Washington Post, the New York Times, USA Today and BuzzFeed News have coverage of his written remarks. Barr, 68, is of counsel at Kirkland & Ellis. He was formerly attorney general in the George H.W. Bush administration. Barr said he was initially reluctant to return to that role because he is partially retired and nearing the end of a long career. Barr said in the memo that Mueller was apparently investigating Trump for telling former FBI Director James Comey he hoped he could let go of the investigation of Michael Flynn and for later firing Comey. But the president has the authority under the Constitution to remove an official, to use his prosecutorial discretion to give direction on a case, or to use his pardon power, Barr wrote. In his written testimony to Congress, Barr said the memo “was narrow in scope, explaining my thinking on a specific obstruction-of-justice theory under a single statute that I thought, based on media reports, the special counsel might be considering. Addressing his priorities, Barr said he wanted to continue the DOJ’s progress on violent crime, although he would “diligently implement” the new criminal justice reform bill, the First Step Act. As part of his focus on crime, Barr said, he will prosecute political violence and attacks motivated by people’s differences. He also pledged to continue to prioritize immigration enforcement. “As we open our front door, and try to admit people in an orderly way, we cannot allow others to flout our legal system by crashing in through the back door,” he wrote. A third priority, he said, is protecting the integrity of elections. That includes ensuring that “the full might of our resources are brought to bear against foreign persons who unlawfully interfere in our elections,” he wrote.